Website lists donors as American Friends Service Committee (AFSC), Bread for the World (Germany), Kurve Wustrow, Kvinna Till Kvinna (Sweden), the Global Fund for Women, and Alliance for Global Justice. Past donors include: Switzerland, European Commission, Oxfam Novib (Netherlands), the United Church of Canada, ICCO (Netherlands), Diakonia (Sweden), Medico International (Germany), The United Church of Canada, SIVMO (Netherlands), Broederlijk Delen (Belgium), Euro-Mediterranean Human Rights Foundation (EMHRF), Norwegian Church Aid, and Rosa Luxemberg Foundation (Germany). Based on information submitted to the Israeli Registrar of Non-Profits, in accordance with the Israeli NGO transparency law, Coalition of Women for Peace received NIS 5,896,468 from foreign governmental bodies between the years 2012-2017 (see chart below for detailed funding information). Funding to CWP and the PSCC was discontinued in the consecutive funding cycle. CWP is a leader in international BDS campaigns against Israel, including through initiating the “Who Profits from the Occupation” project. Promotes the allegation of Israeli water discrimination against Palestinians. The group claims that the shortage of water in the West Bank is “a result of Israel’s policy since 1967, which includes dispossession of water reservoirs in the occupied territories.” NGO Monitor research has determined that CWP’s claims are based on false information and are part of a larger demonization campaign against Israel. 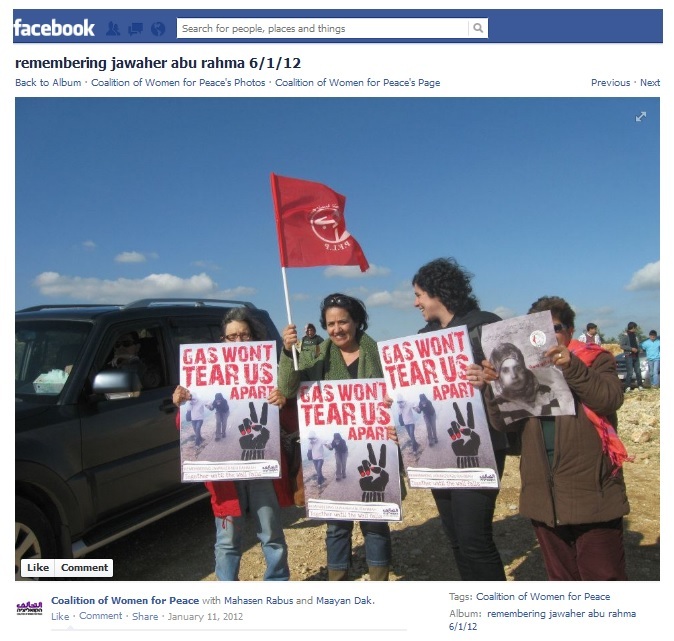 In 2018, CWP campaigned for the release of Khalida Jarrar, a senior Palestinian Front for the Liberation of Palestine (PFLP) official and Addameer’s former vice-chairperson. On April 15, 2015 she was indicted for various offenses including active membership in a terrorist organization (the PFLP) and inciting violence through a call to kidnap Israeli soldiers to be used as “bargaining chips for the release of Palestinian prisoners.” According to Addameer, Jarrar was re-arrested in July 2017 for six months. In December 2017, the detention was extended by another six months to July 2018. The PFLP is a terrorist organization designated as such by the US, EU, Canada, and Israel. Promotes and has organized “Israeli Apartheid Week” activities and events. Utilizes politicized language including referring to the security barrier as “The Apartheid Wall;” stating that it “is committed to the struggle to end the occupation” and claims “to act for peace, justice, and equality in the Israeli Society”; and joining “Zochrot” and “New profile” in recognition of “The 59th Anniversary of the Naqba” on Israel’s Independence Day. In 2009, CWP brought the controversial play “Seven Jewish Children – A Play for Gaza” to Israel as part of its “10 days against the siege” campaign. At CWP’s 2009 general meeting, the organization passed a resolution to support the Palestinian call for BDS. Initiated the “Who Profits” campaign “in response to the Palestinian Call for boycott, divestment, and sanction (BDS) on Israel.” “Who Profits?” is an activist tool and a database that identifies targets for anti-Israel divestment and boycotts. CWP is involved in campaigns against major Israeli banks, the Elbit and G4S security companies, Ahava cosmetics, and Agrexco produce; in support of the Berkeley divestment vote; and a successful divestment initiative with the Norwegian Government Pension Fund. In March 2013, CWP repeated a call for action by the Palestinian Global BDS Day of Action against Israeli institutions and corporations. As of 2009, Coalition of Women for Peace (CWP) has ten members, including New Profile, Bat Shalom, Machsom Watch and Women in Black, and provides an additional platform by which these NGOs promote their campaigns.